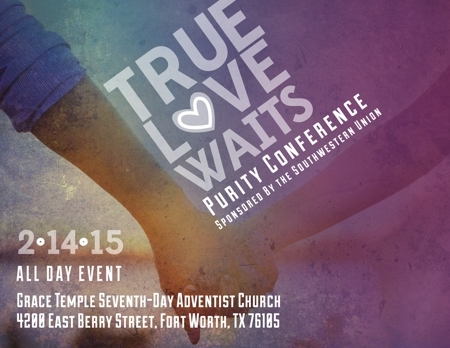 The True Love Waits Purity Conference, emphasizing abstinence, repentance and deliverance, is scheduled for Feb. 14 at Grace Temple Seventh-day Adventist Church in Fort Worth. Sponsored by the Southwestern Union Young Adult/Youth Department, the event is designed to address human sexuality from a Biblical perspective. “This event will be used to empower youth with the Word of God so that the flesh can overcome this weakness and say no to temptation,” says Suzanna Facundo, administrative secretary of Young Adult Ministries. Three breakout sessions are scheduled for the afternoon including: “To Date or Not to Date: That is the Question,” “Boundaries: (Up Close and Personal) LGBTQ” and “Don’t Get Caught Up in the WEB.” Each breakout session will feature its own assigned speaker. The all-day True Love Waits Purity Conference is scheduled for Valentine’s Day. Deadline to RSVP for the Conference is Feb. 7. Free lunch will be provided for all of the attendees who register. Grace Temple Seventh-day Adventist Church is located at 4200 East Berry St. in Fort Worth. To RSVP for this event go to http://www.southwesternadventist.org/youth.